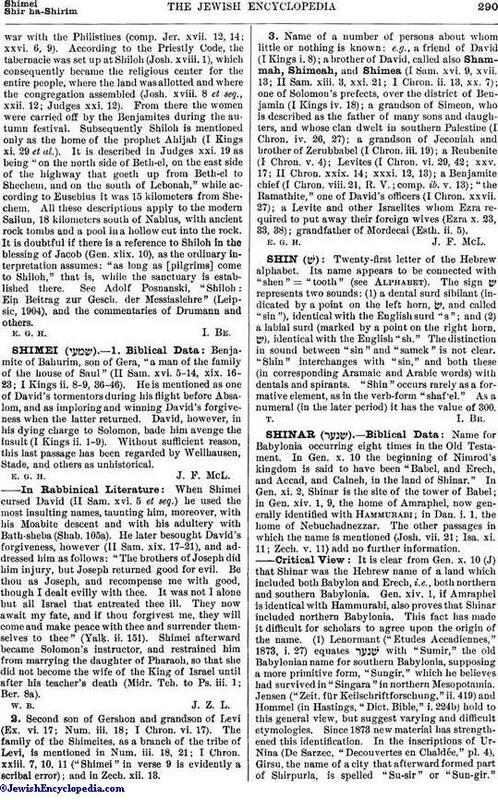 Name for Babylonia occurring eight times in the Old Testament. In Gen. x. 10 the beginning of Nimrod's kingdom is said to have been "Babel, and Erech, and Accad, and Calneh, in the land of Shinar." In Gen. xi. 2, Shinar is the site of the tower of Babel; in Gen. xiv. 1, 9, the home of Amraphel, now generally identified with Hammurabi; in Dan. i. 1, the home of Nebuchadnezzar. 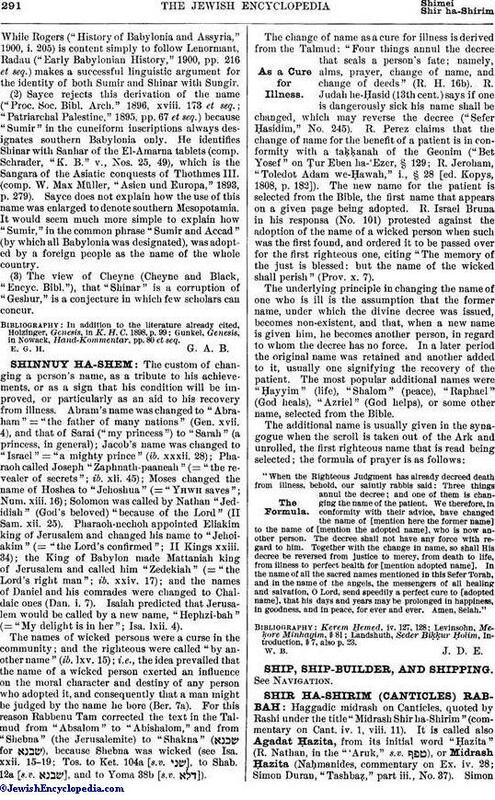 The other passages in which the name is mentioned (Josh. vii. 21; Isa. xi. 11; Zech. v. 11) add no further information. It is clear from Gen. x. 10 (J) that Shinar was the Hebrew name of a land which included both Babylon and Erech, i.e., both northern and southern Babylonia. Gen. xiv. 1, if Amraphel is identical with Hammurabi, also proves that Shinar included northern Babylonia. This fact has made it difficult for scholars to agree upon the origin of the name. (1) Lenormant ("Etudes Accadiennes," 1873, i. 27) equates with "Sumir," the old Babylonian name for southern Babylonia, supposing a more primitive form, "Sungir," which he believes had survived in "Singara" in northern Mesopotamia. Jensen ("Zeit. für Keilschriftforschung," ii. 419) and Hommel (in Hastings, "Dict. Bible," i. 224b) hold to this general view, but suggest varying and difficult etymologies. Since 1873 new material has strengthened this identification. In the inscriptions of Ur-Nina (De Sarzec, "Decouvertes en Chaldée," pl. 4), Girsu, the name of a city that afterward formed part of Shirpurla, is spelled "Su-sir" or "Sun-gir. "While Rogers ("History of Babylonia and Assyria," 1900, i. 205) is content simply to follow Lenormant, Radau ("Early Babylonian History," 1900, pp. 216 et seq.) makes a successful linguistic argument for the identity of both Sumir and Shinar with Sungir. (2) Sayee rejects this derivation of the name ("Proc. Soc. Bibl. Arch." 1896, xviii. 173 et seq. ; "Patriarchal Palestine," 1895, pp. 67 et seq.) because "Sumir" in the cuneiform inscriptions always designates southern Babylonia only. He identifies Shinar with Sanhar of the El-Amarna tablets (comp. Schrader, "K. B." v., Nos. 25, 49), which is the Sangara of the Asiatic conquests of Thothmes III. (comp. W. Max Müller, "Asien und Europa," 1893, p. 279). Sayee does not explain how the use of this name was enlarged to denote southern Mesopotamia. It would seem much more simple to explain how "Sumir," in the common phrase "Sumir and Accad" (by which all Babylonia was designated), was adopted by a foreign people as the name of the whole country. (3) The view of Cheyne (Cheyne and Black, "Encyc. Bibl. "), that "Shinar" is a corruption of "Geshur," is a conjecture in which few scholars can concur. Gunkel, Genesis, in Nowack, Hand-Kommentar, pp. 80 et seq.